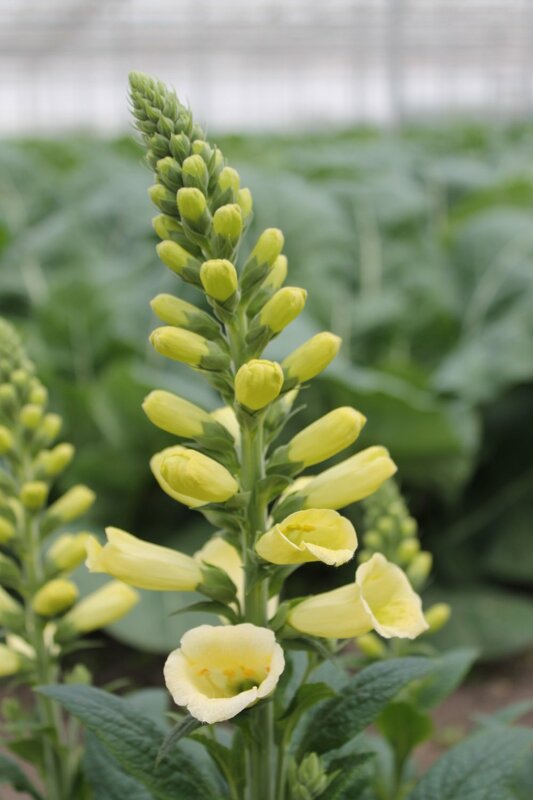 Digitalis Limoncello is a new foxglove bred by our colleague Maarten van der Saar. Both delicate and striking with its luminous pale yellow flowers, 'Limoncello' was Chelsea Plant of the Year finalist at this years flower show. Growing in a slightly unkempt corner of the garden hasn't deterred 'Windsor''s exuberant elegance! These deep bronze red blooms are so striking at the moment, the warm evening sunlight really bringing out a velvety quality in the flowers, mingling maroons and even a few intense pink shades. 'Windsor' is one of our very popular 'Spencer' varieties, ideal for exhibition and cutting. It's been a while since my last blog update, but offline Owl's Acre Seed has been far from idle! We have relocated our production grounds this year nearer to home in East Yorkshire, for ease of management and to begin cultivation on organic certified land. For the time being our seed will not be certified organic (a costly process), but a number of varieties from September 2017 onwards will be guaranteed free from any pesticide sprays and fertilizers, both in terms of treatment during production, and the chemical load of the land on which they are grown. Why do I think it is important to offer organically grown Sweet Pea seed? I believe strongly that care of our land - every inch of it - is vital for the future viability of our lives and those of most other species on the planet. The use of chemicals in ornamental seed production may not seem as contentious as their use in food production, where harmful substances may be directly consumed by humans (UN, 2017. http://www.un.org/apps/news/story.asp?NewsID=56311#.WRXbLtLyvIU). However in every small way it is possible to stand in solidarity with the growing movement to revitalize and protect our land and all that relies on it for survival. I want to support a move away from the use of degrading, toxic chemicals in every area of life, and offering organically produced Sweet Pea seed extends a choice to our customers to support this development too. As this is a new venture, I am excited to see how our plants grow on this different land, and to share our experiences with you as the season progresses - as well as what ranges of seed will be on offer later in the year. I hope all your Sweet Peas are looking happy and healthy! We've got some new Sweet Pea seed in the shop ready for Spring! After many months of waiting, there is now a limited quantity of the gorgeous 'Dark Passion' available - this variety is an unusual dark blue shade, distinct from our other dark coloured sweet peas which have red and purple tones. Also back in stock are 'Charlie's Angel', a very popular pale blue excellent for cutting and fragrance; 'White Frills'; 'Windsor' and 'Our Harry'. Find all these and more in the Spencers section of the site. Further new seed is on the way so keep checking back, or get in touch if there's something particular you are after! A long established soft pink sweet pea which continues to more than hold its own. Winner of the Clay Cup in 1978, 1982 and 1984, and the Leweston Trophy in 1981, it was the second most popular exhibition sweet pea in the 1980s and still the eighth most popular in the 1990s. A reliable performer with large, well placed flowers, this variety has bold seeds and makes a good cut flower. A much loved sweet pea which is highly recommended for exhibition, garden, cutting and fragrance. A very distinctive pale ice blue sweet pea bred by R Chisholm, and introduced by Boltons in 1997. Awarded a First Class Certificate at the SNSPS trials and an AGM. Vigorous and reliable, this lovely sweet pea is hugely popular in Scotland, and is proving very successful as an exhibition variety. This unique sweet pea should be grown more frequently for both exhibition and garden. I sowed these sweet peas a little late, in April, and they took a little while to get going. They don't have the stature of my earlier sown plants, but are looking magnificent all the less and producing copious, fragrant flowers that are absolutely delicious cut in vases in my kitchen. I made rough growing frames out of tall 7ft sticks collected from my local woodland - lots of hazel and hardwood trees so straight, strong sticks aplenty! I filled these out with smaller twigs and branches pushed into the earth for the young plants to climb up. In the foreground is 'Erewhon', then 'Mrs Bernard Jones'; 'Oban Bay'; 'Noel Sutton' and 'Anniversary'. Here is our 2016 crop of Winter Sunshine sweet peas, which have been blooming exuberantly in our East Yorkshire greenhouse since late April. These early flowering varieties are responsive to day length and begin to bloom with the lengthening days of early spring in the northern hemisphere. Owl's Acre also stock Spring Sunshine seed, a beautiful range of sweet peas that flower in the intermediate period between Winter Sunshine and the standard Spencer and Grandiflora varieties. For more information, visit this page. Wild foxglove in Penny's Wood, South Devon, June 2016. Digitalis x Martina in East Yorkshire garden, June 2016.